BOAT OWNER'S NOTES for 2001 FOUR WINNS 235 Sundowner, Call Ken Mattia @ 860 819 9550. Boat is located in Old Lyme, CT.
Overview: This cuddy cabin boat is 23.5 feet LOA with a 8 foot 6 inch beam, It draws 18 inches of water with the drive up and 35 inches with the drive down, It has a 4 foot 11 inch bridge clearance, It is powered by a 5.0 V8 250hp Volvo trim gasoline engine with a dual prop counter rotating outdrive, The propellers are stainless steel, The boat is a V hull design and is very stable even in a heavy chop. Front seating is two captains chairs surrounded by the wraparound windshield and full instrument panel, the rear seating consists of an L-shaped continuous seating arrangement with sink and cooler against the port side gunnel. Features: 65 gallon fuel tank, 20 gallon water tank, console containing sink and cooler and solid surface counter, wrap around seating, storage under side bench seat, engine compartment under rear bench seat which electrically lifts for engine service, floor has the option to be carpeted (supplied) and it has a half-length or full-length bimini /camper top, it has a radio/CD player with speakers both inside the cabin and outside and a butane powered grill that fastens to the sink counter. Additional Information: Dual batteries with a transfer switch, automatic and manual bilge pump, depth finder, anchor chain and rope, full instrumentation, cabin lighting, canvas storage cover, life jackets, portable air horn, flares, Garmin GPSmap 441s which includes depth finder, speedometer and fishfinder, West Marine VHF85 portable marine radio, the trailer is a Four Winns supplied dual axel galvanized steel trailer fit for this boat, Boat is in good conditon and the fuel tank hoses and fuel cell including high and low pressure pumps were overhauled Aug 2014, Boat has always been professionally winterized. Final notes: This has been an enjoyable boat to own and operate, purchased from the original owner in 2011 where it was operated in the northern regions of the Connecticut River, My use has been in Long Island Sound where it has been docked in brackish water, Our lifestyle has changed and we no longer have the opportunity to use the boat, It has served me well. 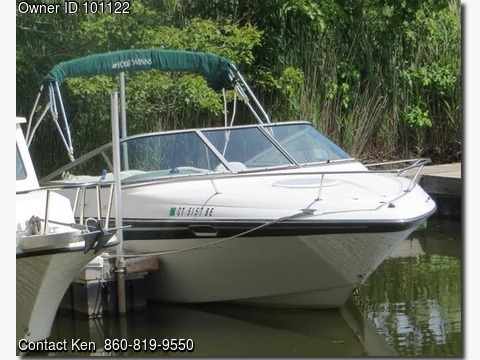 Notes to potential buyers: The boat has approximately only 275 hours on it and is priced to sell, If you have any questions or want to arrange an appointment to see the boat please call me at 860-819-9550.